I have faith, but how come I can’t walk on my water? Then, Peter asked Jesus to command him to walk on water so that he can come to Jesus. And Jesus said, “Come“. But then after seeing all the turbulence and the raging waves, he cowered before them and began to losen his faith. 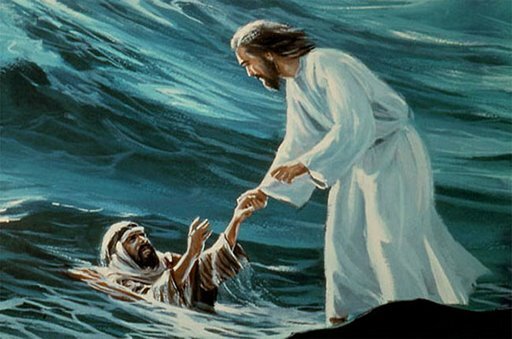 And so, Peter started to sink and cried to Jesus for help. Then Jesus immediately stretched out His hand and caught Peter. Then He said, “O you of little faith, why did you doubt?” [Take a note of those Italic words or sentences]. Most of the times, people tend to be like Peter. At one part of their lives, they totally believe in God. But then at some other businesses in their lives, they’re all anxious and worried. And then, people will start thinking more toward the problems instead of the answers, and they’ll start to over reacting toward the problems. Don’t be too occupied with the low level of trust! Because the key to grow the trust to Him, is to see who Jesus really is. Just like in our day to day lives. When we face our darkest hour in this life, or even when you reach to a certain point when you finally say, “Where is God?”, do understand that our God, is a Faithful God. When you can’t come to Him, He’ll come to you. Your God, your King, your Savior, your Best Friend Ever, your Coolest Dad, will always, and I mean always, come to you. Sometimes He let us be and ignore us for a reason; that is, to prepare us to receive His full blessings, and to be more like Him. He teaches the children He cares about! Author AndrewPosted on October 5, 2011 October 5, 2011 Tags Bible, Christianity, Faith, Jesus, Walking on Water4 Comments on I have faith, but how come I can’t walk on my water?